SOURCE – The Los Angeles Lakers and New York Knicks are preparing to make offers for New Orleans Pelicans superstar forward Anthony Davis, league sources told Yahoo Sports. This makes absolutely zero sense. 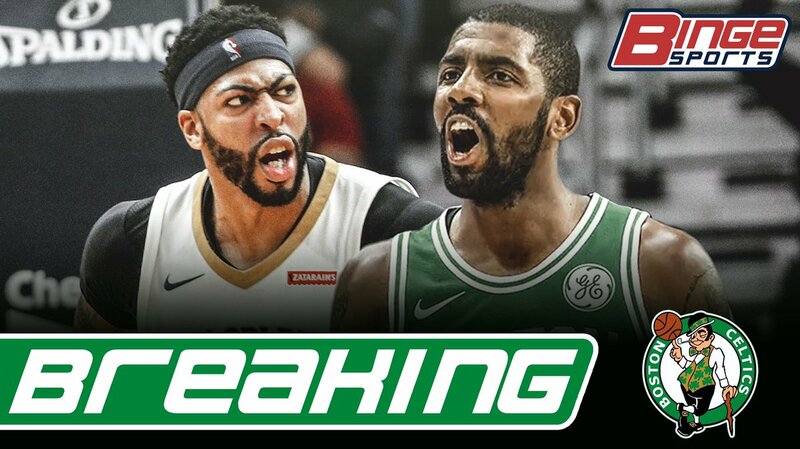 So you are telling me that “sources” are saying the Pelicans should trade Anthony Davis at the trade deadline and not wait till this summer because Kyrie, who already said he is re-signing with the Celtics, is not going to re-sign. That because of the uncertainty of Kryie, AD won’t want to resign. Even though that the Celtics cannot trade for AD until AFTER Kyrie signs with the Celtics. This makes absolutely no sense. The Celtics can’t trade for Davis until after the Celtics re-sign Kyrie because of the Rose Rule where you can not have 2 players with the types of contracts that Irving and Davis both have. So, if the Celtics wanted to trade for AD, they must wait until July 1st after Kyrie signs his extension with Boston. Well, shouldn’t that clear any roadblock of AD not wanting to re-sign with Boston then? If Kyrie re-signs, like he already said he would, then AD would have no problem coming to Boston. Woj even said on that Boston has the best assets to trade from in the whole NBA. There is absolutely no reason for the Pelicans to trade AD before the summer. If they can wait, they can not only use the Celtics to drive the price up, but they can also see where each draft pick in the lottery stands. It’s very obvious that the sources are trying to make it look like the Celtics are not a destination for AD and that the Lakers are the obvious choice. Between the media’s love for the Lakers and everything that has to do with LeBron, I have a feeling this AD to LA stuff isn’t going to die down the next 10 days leading up to the trade deadline. However, Boston’s assets are much better than the Lakers’ assets and there is no reason for the Pelicans to take a worse offer to a team they are already basically calling out for tampering. I am not saying the Celtics are going to get AD. But I am very confident that they Pelicans will not trade him at the deadline. I know Rich Paul wanted this to come out now to help the Lakers and his best friend LeBron, but New Orleans must wait until the largest bidder at least can make a bid. I will give Rich Paul and LeBron credit though, between the media and Klutch Sports, they are pulling a lot of strings to get everyone think Davis is Holywood bound. The way it is coming off, it almost seems like they are trying to sell AD on the Lakers. You just know that Rich Paul is going to do all he can to try to convince AD to tell the Pelicans that he will only resign with Los Angeles. And if that is not tampering that what the hell is.